Teachers teach, so they should know everything, right? Wrong. They're just like any other person, they too have things to learn and you can play a part in helping. Education in South Africa is a contentious topic. Many have tried to improve the education system - curricula have been altered, syllabi have been changed, but we still see children struggling on numerous levels. Louise van Rhyn, an academic and a businesswoman, looked at the state of our nation's education system and felt compelled to do something. Van Rhyn is the founder and CEO of the non-profit organisation, Symphonia for South Africa, and the organisation established their flagship programme Partners for Possibility. Also read: Always wanted to help? Here's how to get started! The Partners for Possibility programme pairs a school principal and business leader and together they learn and develop - as leaders in their respective positions and as human beings. In pairing principals with a businessperson, they become better equipped to perform their core functions as a leader of their respective school. They also learn methods of engaging with key role players in the school community; people who would make a difference, no matter the size of the difference. Established in 2010, the programme aims to help school leaders work toward alleviating many social ills faced on a regular basis. "We found that many of the principals in these schools are ill-prepared for the overwhelming task of leading a school. A school is a complex organisation with staff, parents, unions, along with many social ills such as poverty and teenage pregnancy, very limited budgets and high demands from the community, the governing body and the regional education department,"said van Rhyn. Van Rhyn was the first businessperson to partner with a school principal in the hopes of mobilising change within the school and the community where the schools is situated. 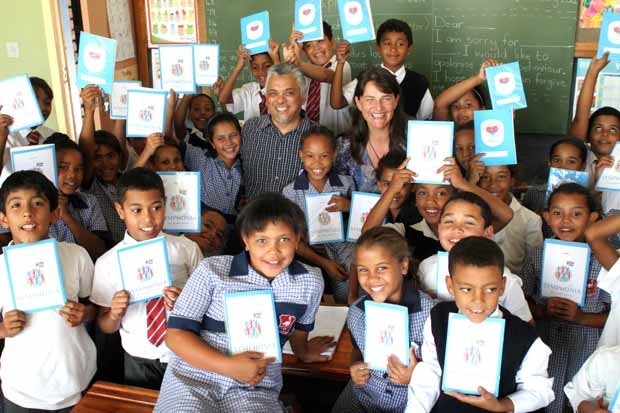 She partnered with Ridwan Samodien, the principal of Kannemeyer Primary in Grassy Park, Cape Town. While Samodien could have regarded himself as a guinea pig for van Rhyn's project, he didn't. With an open mind and an open heart, he went into the partnership and worked hard to learn from van Rhyn's wealth of knowledge. He said: "Five years ago, I did not possess the knowledge, the skills and an awareness of my purpose. "Education is one of the most essential things people have to go through. It is the only weapon that can rid one of poverty and because of this, we all have to get involved. "We have to co-create the conditions that set things in place to provide all our children with quality and holistic education, connecting the left and the right brain." The programme aims to reach 2000 schools by 2018 and they have a long list of school principals waiting for an opportunity to join. They also have the PfP500 programme and the aim is to mobilise 500 people to donate R200 per month for 10 months, or R2000 once-off, to help fund the programme. Business leaders who are keen to make a contribution and who are willing to share their knowledge and skills generously are encouraged to make contact with the organisation. "We usually look for a business partner that is older than 35, with a few years management experience. "Those who wish to get involved can enquire by visiting our website: www.PfP4SA.org. We host regular information sessions in all regions where we are active - notably in Cape Town, Port Elizabeth, Durban, Johannesburg and Pretoria", said van Rhyn. While training and formal learning is of great importance, personal development plays a big part in building leaders as well, which ultimately leads to a successful partnership. Van Rhyn said: "Principals report a new sense of purpose and energy from having a business leader listen to and support them in their goals. "Business leaders report a far deeper sense of social responsibility, love for their country and a far more comprehensive leadership toolkit. "We are very thankful that so many people are starting to see the positive results of our programme and we hope that this will get more business people and donors involved, because the need is so great."